East Texas has an abundance of trees in its many forests. 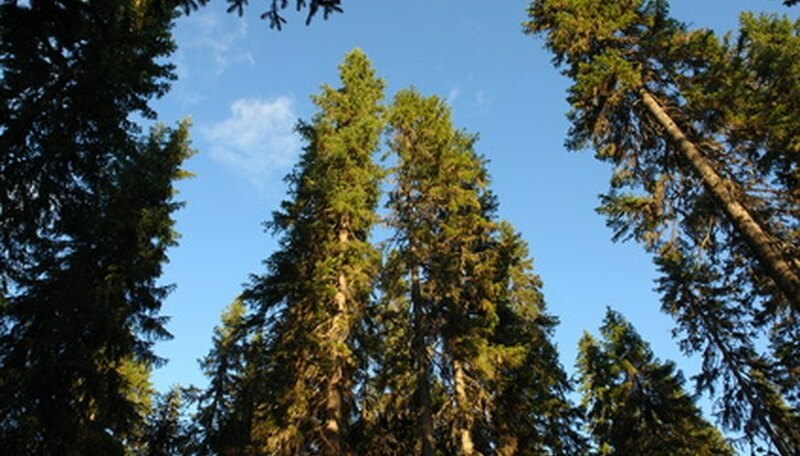 This region is mostly composed of the pine forests known as the Pineywoods. It encompasses 44 counties, extending from the northeast corner of the state and continuing southward to the area that borders Galveston Bay. From the east the Pineywoods begin from the Louisiana border and go westward to the Black Prairie area. Oaks and hickories also dominate the forests of East Texas. The Pineywood forests of East Texas contain 2.8 million acres, according to Texas A & M University. East Texas has many tall trees, with some considered national champions for their height, notes Texas Escapes. For example, there’s the 110-foot black gum, which is both a state and national champion. Also included in the Hercules Club are the black-gum tree, which stands 66 feet tall, and the 61-foot-tall blackjack oak. The landscape of East Texas ranges from rolling or hilly in the north and central regions to flatter areas around the Gulf of Mexico, notes Texas Beyond History. East Texas is one of the wettest regions in Texas. While much of the area receives significant moisture, other portions are drier. This variety of moisture and terrain produces different trees in East Texas. Native species of the yellow pines include the longleaf, shortleaf and loblolly pine. Pines, hickories, oaks, elms, black walnuts, sweetgums and tuleos make their home in the Pineywoods. The Post Oak Belt or Post Oak Savannah area, east of the Pineywoods, mostly contain post oaks, a few live oaks, blackjack oaks and black hickories, according to Texas A & M University. Recently, some species (including hollies, cedar elms, ester red cedars and sugarberries) have replaced historical trees. The Bottomlands, which are south of the Pineywoods, are typically dominated by native hardwood trees--including oak, water oak, cherrybark, bitternut hickory, black hickory, black tupelo and sweetgum. A thick understory of tree growth includes small trees--such as waxmyrtles, American hornbeams, viburnums, rusty blackhawks and yaupons. Many fruit and nut trees are not suited for East Texas, warns East Texas Gardening. This is due to climatic conditions such as early or late freezes, humidity, disease problems and extremely hot East Texas summers. Some trees to avoid planting in East Texas include pistachios, almonds, gooseberries, currants, filberts and kiwis. Also, although the apricot tree is a hardy species, it’s also inconsistent.